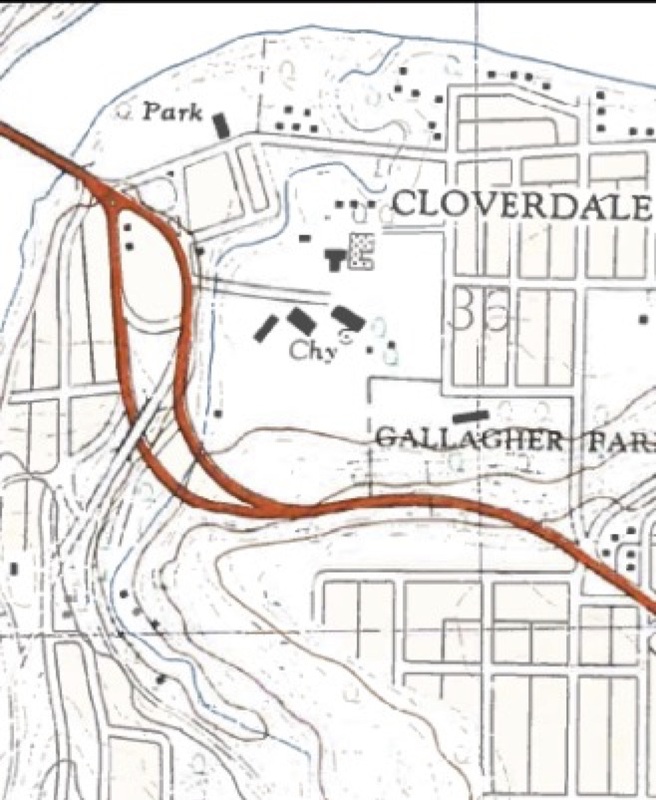 Up until 1970, the Mill Creek flowed through the ravine as we know it today, under what is now Connors Road, between 98th Avenue and the current site of the Muttart Conservatory, and finally under 98th Avenue to empty into the North Saskatchewan River. 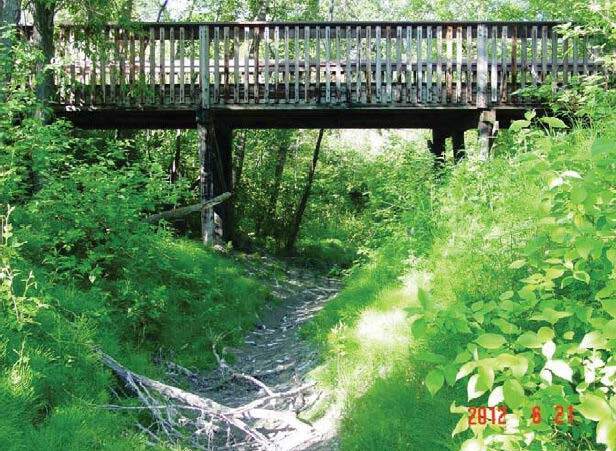 You can still see the delta today – just walk east of the Cloverdale footbridge, and the first wooden bridge you cross, shown below, crosses the abandoned creek bed. Edmonton faces a choice with the design and construction of the Valley Line LRT project – either the project can be designed to include or accommodate a future re-animation of the legacy creek bed and delta – which is a provincial priority according to the Environmental Assessment of the Valley Line – or it can render even more permanent the decisions made in the 1960s and 1970s that transportation infrastructure trumps our natural environment. Figure 1 Mill Creek bed. Source: Spencer Environmental and City of Edmonton. The City has completed both their initial environmental assessment for the project, tabled in July of 2013, as well as an updated assessment, released in February, 2015. In the initial environmental assessment, it is stated that, “The City of Edmonton and Alberta Environment and Sustainable Resource Development (AESRD) have committed to evaluating the potential to reestablish connectivity of the Mill Creek system, including the reach located within the study area. Based on this strong desire to retain the channel in its current condition, and the long-term restoration efforts required if disturbed, disturbance and backfilling of parts of the channel is rated as an adverse, minor, long-term and predictable impact. It is minor not because of its importance but because of the small reaches included in the project area.” While it is true that preserving the existing delta and remaining abandoned channel is important to eventual re-animation, it’s also important to consider what additional infrastructure is being placed in the creek’s historic path – in this case, a rail line, a 300 ft rail siding, and the Muttart Conservatory station – and how that infrastructure could accommodate a re-established creek. That the station for the Muttart Conservatory would be placed on or adjacent to a lost creek bed is, perhaps, an unwelcome irony. Having the station adjacent to, and/or designed to accommodate a re-established creek would be more fitting. In the most recent assessment, the City has stated that they have redefined project boundaries to minimize impacts on the abandoned Mill Creek channel, but they haven’t addressed the more important point – what about the impact of the project on potential efforts to re-animate the channel in the future? 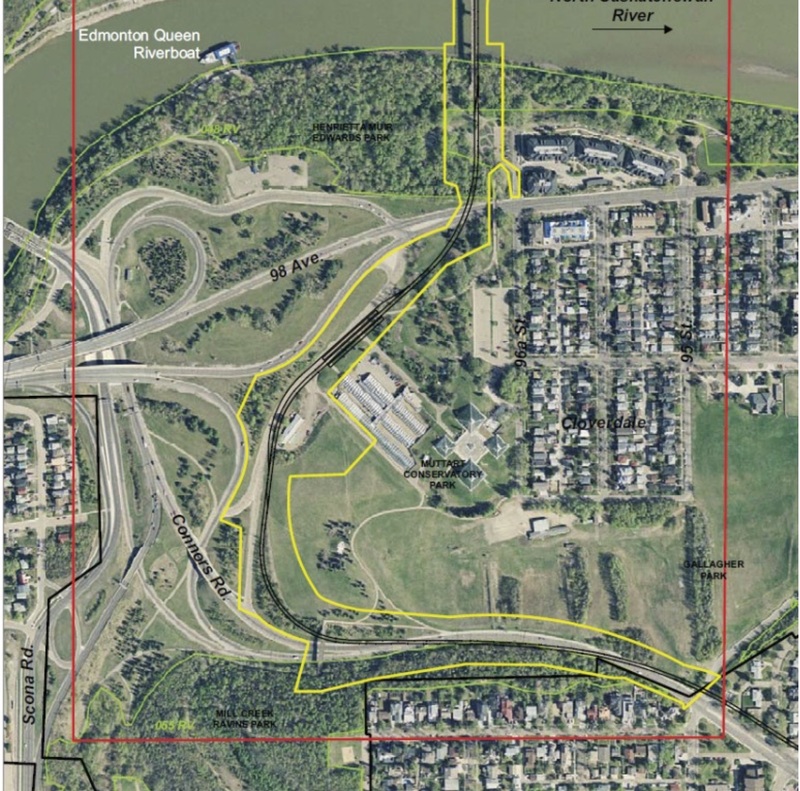 On the two maps above, you’ll see that the project boundaries, from the south bank of the North Saskatchewan River through to the Connors Road footbridge encompass the entire legacy creek bed, with the exception of small areas on the north side of 98th avenue. Building the Valley Line in this exact right-of way would, potentially, preclude the reestablishment of connectivity of the Mill Creek, or render it prohibitively expensive. That said, the Valley Line LRT construction project, done right, could provide the best opportunity to re-establish the Mill Creek that we’ve seen since it was diverted in 1970. The City has established that P3 contractors for the Valley Line must provide means for wildlife to cross Connors Road and the tracks by means of an underpass, providing access for smaller animals (skunks, coyotes, rabbits, etc.) to Gallagher Park and the Edmonton Ski Club grounds. Further modification to the plans, involving a daylighted creek channel and wildlife access along with the creek flow under 98th ave as part of the project would allow the project to have a positive impact on the natural environment, enhance regional biodiversity, and allow for the re-establishment of an important historical attribute of the City of Edmonton. Given the height of both Connors Road and 98th Avenue relative to a re-established creek bed, it is unlikely that major roadwork would be required to complete this project. Re-established creeks are amazingly resilient – in Burnaby, BC, the long-diverted Still Creek was re-established and today, salmon spawn in the creek. A properly-designed Valley Line could bring thriving fish populations back to the Mill Creek and re-establish an important link in the North Saskatchewan river ecosystem. If you think this is an initiative you could support, contact your City Councillor, your MLA, or your MP – all three levels of government matter here. While the LRT is a City of Edmonton project, it will be funded by all three levels of government so they need to hear from us. Want to get involved? Contact Andrew Leach at leach.andrew@gmail.com. PDF of a Presentation to the Transportation Committee of Edmonton City Council for March 25, 2015. I don’t update this blog much now, as most of my writing goes to Maclean’s – please check here for the latest – as well as occasional posts at the Globe and Mail here. I hope to post move back to posting more technical analysis here in the near future. This week, Press Progress and the Vancouver Sun’s Peter O’Neil reported that Kinder Morgan had quantified the economic benefits of oil spills in its application to expand the Trans-Mountain Pipeline from Edmonton, Alta. to Burnaby, B.C. Yes, the benefits of oil spills—they create jobs in the communities where the spills occur. Beyond being a public relations disaster for the company, this should lead us to re-examine what we accept as proof of the economic benefits of projects in general. Companies facing regulatory hearings like Kinder Morgan, groups promoting events like the Vancouver Olympics, or politicians justifying public expenditures like the new hockey arena in Edmonton generally talk about the benefits of their projects using a tool called economic impact analysis. This technique takes spending, runs it through a statistical model, and predicts impacts of that spending on both GDP and employment. There are, basically, two issues with this method, and both are wonderfully illustrated by the oil spill example. First, the method is agnostic as to what the money is spent on, so money spent cleaning up an oil spill looks remarkably similar to money spent building a new hospital or school in terms of economic impact. Second, the technique generally does not account for where the money comes from, or how it would otherwise have been spent. Money spent on a hockey arena in Edmonton might otherwise have been spent on light rail or tax reductions, both of which would also have economic impacts. In the case of an oil spill cleanup, the costs are likely to be directly incurred by an insurance company, but the premiums paid for that insurance come at the expense of the value of the oil transportation service—the higher the expected clean-up costs from oil spills, the higher insurance premiums will be, and this will mean higher pipeline tolls, which in turn implies lower profits, taxes, and royalties on the products shipped. Simply-put, there’s no free lunch. Read more at Maclean’s Magazine. There’s no shortage of blame being passed around in the wake of another delay in the U.S. regulatory approval process with respect to TransCanada’s Keystone XL pipeline which, it was announced last Friday, will now drag on for at least another six months. Among other reasons cited for the decision, the Calgary Herald’s Deborah Yedlin and others have cited a lack of greenhouse gas policies applied to Canada’s oil sands. Yedlin is direct, saying that, “the evidence to date suggests (that the Harper government hasn’t listened to what is being said in Washington) because the Harper government has not moved on anything resembling a policy on greenhouse gas emissions.” I think she’s right, to a point, but I think the problem is not that we haven’t been listening, but that our governments, both in Edmonton and in Ottawa, have yet to establish a coherent vision on anything which includes the words climate change and oil sands. This post previously appeared at Maclean’s magazine. Many of you have noticed that I suspended my Twitter account over the weekend. I expect that this will be a temporary decision, at least in some respects, although I am not sure what my re-engagement will look like. I’ve used Twitter for many years now, and I love the medium for news, learning, and interacting with people whom I’d have never had the chance to meet without it. I am not sure that I can balance all that I like about it with the feeling of always being in an argument. This decision has nothing to do with abuse, trolls, or the like – it’s exactly the opposite. Those who bring nothing to a discussion are easily blocked or ignored, but it does not make sense nor is it my wish to ignore those who challenge my ideas, push my thinking in different ways, and force me to defend my position against rational, reasoned arguments. Unfortunately, I’ve done a poor job of balancing my engagements with all of you on Twitter with the other things that matter in my personal and professional life. I’m going to try to fix that, and hopefully I’ll be back @andrew_leach sometime in the next 29 days. * My account is re-activated so you can use lists again if you had been doing so. Today’s Globe and Mail featured a column by Gary Mason on a world without oil. “If you believe that the economy is structured in such a way that it needs to grow continually in order to survive,” it states, “then it will take an endless supply of energy to feed it. ” The article then raises the question, “How does an economy grow exponentially forever if the one element it needs more than anything to flourish is contracting with time?” This is a common refrain from environmentalists such as David Suzuki (here, here, here and likely a thousand other places): “it’s absurd to rely on economies based on constant growth on a finite planet.” But, is it? I’ll have more on this at Macleans in a couple of days, but this will serve as a technical primer. Yesterday, the Pembina Institute and Equiterre released a report entitled Booms, busts, and bitumen: The economic implications of Canadian oil sands development. The report opens with a foreword from University of Ottawa economics professor Serge Coulombe. His opening paragraph states that, “Environmentalists don’t accept gross domestic product (GDP) as a complete measure of well-being in the same way that economists do.” This statement is astounding for its ignorance of the discipline, not to mention the irony of it having been written by an economist. Worse, it validates a trend among the environmental movement in Canada, spearheaded by David Suzuki, to dismiss economists as the enemy of the environment. I don’t know of a single economist who thinks this way. We may disagree on the relative values of environmental amenities but I can’t think of anyone who would argue that they have zero impact on welfare or that GDP is the only relevant measure of well-being. David Suzuki often talks about the Economics 101 course he took which ignored externalities. That certainly didn’t match with my recollection – the second half of my microeconomics 101 course was all about market failures due to monopoly, incomplete information, public goods, or environmental pollution. If you look at Greg Mankiw’s Principles of Economics, likely the most widely used introductory text, you don’t even get to discussions of GDP until page 491 in the Sixth Edition. Externalities are covered over 200 pages earlier, on page 195. When you get to talking about GDP, there is a muti-page section which begins, “GDP is not, however, a perfect measure of wellbeing…” The section goes on to discuss things such as the value of leisure, the costs of pollution, the value of home production, etc. Gee, that almost sounds like something David Suzuki would write himself. David Suzuki is also a strong proponent of evidence-based policy. If you agree, you might want to read this, from Fullerton and Stavins, on how economists really think about the environment. Update: via Dan Gardner, this piece from the New Yorker is excellent. It quotes Kuznets, who formulated the tools to measure GDP in the US, as saying that, “the welfare of a nation can…scarcely be inferred from a measurement of national income.” I guess Kuznets must have been an environmentalist, not an economist. This motion provided me with the motivation to dig into a question – if you had a given amount of capital to spend in the oil sands, would an oil sands mine alone or an integrated project with an upgrader generate the largest value-added return on investment, including total wages, royalties, taxes, and profits, and how would these be distributed? To tackle this question, I ran two iterations of an oil sands project model based loosely on Suncor’s Fort Hills project combined with upgrader assumptions based on Suncor’s now-cancelled Voyageur project. This morning, Suncor held an investor conference call to discuss the decision announced late last night that it would proceed with the development of the Fort Hills mine – a joint venture with Total and Teck. Everything associate with this project is huge – it’s expected to produce 180,000 barrels per day and to cost 15 billion dollars up-front to build. This morning, CFO Bart Demosky laid out Suncor’s financial analysis for the project, and stipulated that their internal analysis found an internal rate of return of 13% – respectable for an oil sands mine. Oil prices of $100/bbl (Brent) and $95/bbl (WTI), AECO-C gas at $3.50/GJ, all increasing at the rate of inflation. Bitumen prices at 60% of WTI, which implies a $25/bbl differential between WTI and Western Canada Select, a 30% blending ratio, and a $6/bbl premium for diluent over WTI (differentials increasing with inflation) . Operating expenditures of $20/bbl, increasing with inflation. Sustaining capital expenditures of $3/bbl, increasing with inflation. Production horizon of 50 years, with cumulative bitumen production of 3.2 billion barrels. So, my royalty numbers are higher than Suncor’s, which should indicate that the project as I’ve modelled it has higher net revenue. I’ve taken account of Alberta’s oil sands royalty regime, federal corporate taxes (standard Class 41 CCA), Alberta’s SGER maintained ad infinitum. Despite this, I get a lower after-tax IRR. I know of a few other people with similar figures. So, people of the internet, what am I missing?